• We can organize sightseeing tours for your group. We have the very best drivers and local tour guides. If necessary, we have guides available to conduct tours in English and Chinese. If you need a tour conducted in another language, please contact us and we will find the perfect guide. We welcome you to work with our knowledgeable staff to customize a tour that fits all of your needs. 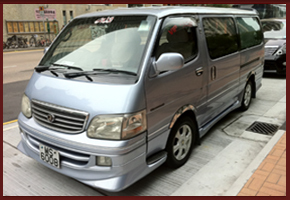 Groups of 3 passengers and up can be customized to suit your schedule. • We can arrange short or longer tours of the Hong Kong taking you to the places you want to go. Having travelled so far it would seem a shame not to take some time to Hong Kong. Ideal for the busy corporate and business traveller. • Hong Kong Island and Kowloon Peninsular is a cosmopolitan city with its high-rise apartment blocks and busy roads. On contrasts, The New Territories of Hong Kong, has an enormously diverse suburban area, a blend of traditional customs and modern ideas, of scenic beauty and man-made achievements. Hong Kong is a China city for tourism, which is known as a fine place to visit for business, trade shows, convention, conference, shopping, food, recreation and entertainment. • If you would like to take a sightseeing Hong Kong tour, Macau tour or Shenzhen tour when you are visiting Hong Kong, whether it is a visit to the Victoria Peak, or taking a Victoria Harbour Cruise at night, the Ocean Park tour, or the Hong Kong & Macau Excursion Tour, a Shenzhen Excursion tour, or Guangzhou tour, please complete the order form to reserve your selected tour, we will confirm your reservation within 2 working days. • Chauffeured limousine services for weddings, parties, evenings "on the town," sporting events and more,Let us assist you with transportation for your next company excursion, sales meeting, or convention transfer. • We provides car service for corporate events, exhibitions or any major social event.